A modern and robust democracy does not build itself. It takes work and dedicated leaders. 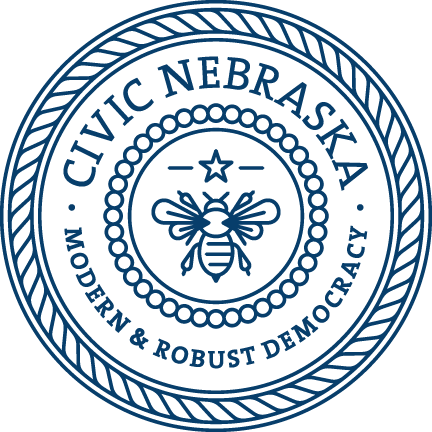 It starts on our streets, in schools, and neighborhoods, and that's where you will find Civic Nebraska. $15 provides postage for a middle school class to send letters to their senator. $20 protect against Voter ID laws in Nebraska. $36 provides materials for a Voter Advocate Training. $74 funds 1 Civic Health community conversation & asset mapping. $320 funds a entire capital experience day for a rural classroom. Civic Nebraska’s Community Learning Center at Dawes Middle School recently began an extended engineering track on Mondays, Wednesdays, and Fridays, open to all Dawes students interested in engineering. Project Lead the Way Engineering Club facilitator Amanda Woodward and Kristin Page, industrial technology instructor at Dawes, shared an update on how the initiative has taken off. At Dawes Middle School, we’re piloting engaging new curriculum as an Engineering Club after school three days a week. The Project Lead the Way Gateway professional development has led us to consider new engagement strategies and to show engineering career paths in medical, manufacturing, and production fields. We know this exposure will lead students to make informed decisions about the classes they elect in high school, and eventually lead them to engaging career paths. We were recently very lucky and received a 3-D printer from Lincoln Northeast High School. The printer has captivated students with the promise of 3-D printing their prototypes and successfully leads to talking about additive and subtractive manufacturing. Students began exploring engineering design by creating a foot and ankle orthosis for a student with cerebral palsy. This gave us a unique opportunity to investigate what different disabilities are with students in our club. Providing an open dialogue about students with disabilities allowed many students dispel myths and misconceptions they may have held. Next, we presented the Puzzle Cube Design Challenge. This project let students explore isometric sketching by creating as many unique puzzle pieces as possible using snap cubes and sketching their creations. Students then worked through a list of constraints to create a puzzle made of five different puzzle pieces (from the isometric sketches), totaling 27 cubes. Students challenged themselves to create peculiar and remarkable puzzle pieces that fit together without falling apart easily. Once students had the puzzle planned, they glued ¾-inch wooden blocks together into each of their pieces. Several days were spent creating orthographic drawings for each puzzle piece, and it was pretty incredible to hear students running around and yelling to each other how orthographic drawings are supposed to look. One of our favorite parts of the Engineering Club has been showing students 3-D modeling software. The efficacies they learn are the same as what drafters, designers, and engineers are using at firms across the country. The kid-friendly software called TinkerCAD uses many of the same keystrokes and modeling techniques that are used in the world of engineering with programs like Autodesk Inventor and SolidWorks. Before we started modeling, everyone used dial calipers to record the dimensions of each puzzle piece. That allowed students to make precise and accurate models of the puzzles they created. To add a math connection, students set out to test how challenging the puzzles were. We taught students to use measures of central tendency, which helped them to ascertain the common amount of time it took for their puzzle to be solved. This allowed students to determine how challenging each puzzle was. Each week, we dedicate one club meeting as our Design Challenge meeting. Students are using TinkerCAD and SketchUP to design C02 cars they will race. We worked to create a stringent set of criteria and constraints that ensure the C02 cars will be safe to race as well as require thoughtful attention to detail, math, and problem solving before students 3-D print. Thanks for the opportunity to show how inspired students are about engineering.